Don't judge a bottle by it's cover. A hastily organised Zinfandel/chili pairing, in Vinoland tonight, was quite a success. Ten mystery wines - and I say wines as two bottles turned out to be something other than Zin - vied to be top dog, or rather in this case, top animal. When Vinomaker tastes wines blind, he likes to use combinations of numbers, or animal names, written on plain brown paper bottle bags to identify each wine, instead of the simpler numeric system of numbering the bottles 1, 2, 3, etc. Vinomaker, and his friend Sky King, believe that tasters experience some sort of number/cognitive bias when faced with a wine numbered 1, versus a wine numbered 10. I don't think I have ever had a problem with number bias (although I am fond of the number 3), but apparently some people do. So, when faced with ten bottles of wine - sporting animalia monikers such as pig, sloth, Bluetick Coonhound (a late entry, don't ask), and eel - I displayed no bias towards ugly creatures when I picked toad (very closely followed by lemur) as my favourite wine. The terrific toad had the good fortune of turning out to be a delightful 2009 Joel Gott Zinfandel from Amador County; extremely varietal like, pepper, raspberries, red currants, and superbly smooth. The lovely lemur was a 2010 Black Cat Zinfandel from Howell Mountain; redolent with oodles of vanilla, and the bouquet, and matching palate-pleasing taste, of the best cherry pie ever. Yum! My least favourite wine was bat (and I'm really quite fond of that particular mammal) which turned out to be a 2009 Ravenswood California Zinfandel ($10); mystery spice, mystery fruit, some oak/vanilla, and hot. Moral of the story? None really, except perhaps that a lowly toad may just turn out to be a prince of a wine. The Orange muscat vines are seemingly full of the joys of spring and are racing, bud first, towards their initial sulphur application of the 2012 growing season. The vine's leaves don't look like they were damaged by the two most recent frosts in Napa. However, frosts this time of year are an ongoing threat to winegrowers the length and breadth of the valley. Back on April 21st 2008, Napa experienced it's latest spring frost in 35 years, causing widespread losses to growers of white and red grape varieties. Nobody wants to see a repeat of those particular climatic conditions. I finished pruning the Syrah vines today...whoo hoo! Like last year, the buds were already pushing which made tying the canes down a little difficult. I still have to finish tying down the canes in the Cabernet sauvignon block and weather permitting I hope to be all finished by Sunday. At least, that's the plan. In a small, personal effort to stimulate the sluggish US economy I decided to buy, as a birthday pressie to myself, a new camera. I didn't really need a new camera, but a new camera I now have. The Nikon D3100 is a bit of a step up from the D3000 I have been using for the past 18 months, but it's still just an entry level DSLR. I have a Nikon D50 which is a more serious camera, but more importantly perhaps is the fact that the lenses I use with the D50 are much more serious lenses than the kit lens that the D3100 comes with. Not being too expensive a DSLR, this is the camera that I am most likely to throw into my handbag and take everywhere with me. And yes, I am more often than not to be found out in the vineyard with this camera slung about my neck, on the off chance I spy something that may be of interest for me to blog about. Besides, this camera is very pretty and comes in a snazzy Vinogirl Red. For my birthday dinner, Vinomaker decided to take me to Ristorante Allegria in downtown Napa. We have been there many times before and have always enjoyed it: we are done with experimenting with new restaurants for the time being. Allegria is a comfortable, unpretentious establishment. Located in an old bank building, Allegria features California cuisine with an Italian influence: actually it is quite far removed from authentic Italian food, but the food is always of the highest quality. Vinomaker and I began the evening with a glass each of Villa Sandi Prosecco, which was a very pleasant tipple, whilst we waited to order. 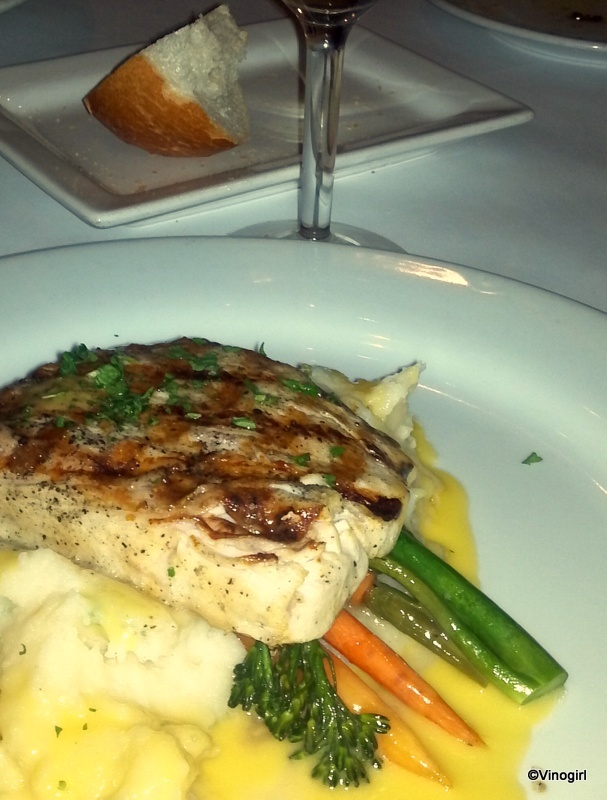 For my main course I ordered the mahi mahi with garlic mashed potatoes in some sort of mango sauce. I was too busy (thinking about chatting), to really listen to the waiter's description of this dish which was one of the evening's specials, but he had uttered those magic words garlic mashed potatoes, so I was completely sold. My fish and potato combo was delightful fare and Vinomaker thoroughly enjoyed his Pappardelle Allo Zafferano. Our wine selection was a bit of a disappointment, so I will abstain from besmirching the winemaking abilities of a certain Napa winery. All in all it was a very pleasant evening. Thanks Vinomaker. ...We're gonna have a good time! Yes, once again, it's the anniversary of my birth (thank you, mother). Aren't birthdays great? I had a bit of a lie-in this morning, and then the festivities began. Over a leisurely breakfast, I opened my cards and my presents - jewellery (including the antique spoon-ring above) and bubbly. What more could a Vinogirl ask for? I started to prune Vinoland's Syrah vines yesterday afternoon, but rain stopped play! Today, when I finally made it out into the vineyard, after my weekly phone call to Blighty, I was joined in the Syrah by a Pipevine Swallowtail (Battus philenor). This beautiful butterfly fluttered from the vine on to my sleeve and then proceeded to get quite comfortable on my hand, then a vine, as I took his photograph. Most likely docile because of the 31 degree temps this morning, he was quite content to rest on my thumb, in the sunshine, until I got bored and unceremoniously dumped him on a stray daffodil - a Vinogirl has to prune! I didn't think it fair that I should ignore the Patron Saint of Ireland when I had already feted the Patron Saint of Wales, St. David. And, it's not as if I'm going to ignore St. George now is it? I suppose that means I'll also have tip my hat to St. Andrew in November. Americans love St. Patrick's Day. I don't get it. I grew up veritably surrounded by people of Irish descent in Liverpool, and I've got to say, not a whole lot of attention was paid to it as a holiday. Personally, the closest I ever got to celebrating on Paddy's Day (and by close, I literally mean proximity) was when, as a teenager, I accidentally bumped into an inebriated old dear, complete with shamrock festooned lapel, exiting the Irish Centre on Mount Pleasant in Liverpool city centre. Vinomaker was given this wine by an attorney friend after a tennis event they both played in: Long story short, it's a delicious wine. I'm not going to get all boring by describing this wine myself, instead I'm going to pilfer the 2007 C'est Si Bon's tasting notes directly from the Elyse website because their description of the wine is possibly the closest description, to actual taste, I have ever come across. C'est Si Bon (It's so good! ), is made from grapes indigenous to the Rhone Valley in Southern France. This medium body wine has delightful aromas of dried raspberries, tangerine peel, white pepper along with hints of earth and dried herbs. On the palate, flavors of wild plums, raspberries, currants and a hint of minerality lead to a creamy mouth feel and genuinely long finish – and is way too easy to drink. OMG! Way too easy to drink is a gigantic understatement. This wine is so smooth, the soft vanilla characteristic on the palate is so moreish and - oops, I said I wouldn't wax lyrical with my own particular descriptors of this wine. But, priced at around $28.00 retail, this is a great wine. It really is so good. When British Prime Mininster David Cameron sits down to break bread with the American President, at a state dinner in Washington DC this evening, we the people will have no clue as to what wines are paired with each course. At a time when the entire US economy is suffering, not just the sales of domestic wines, the White House has decided to forgo the long tradition of disclosing the identities of the wines that are served at state dinners, including those that will be poured at tonight's repast. Instead, the menu details released to the press simply stated "an American wine will be paired with each course." Rather than using this occasion to showcase American wineries, agriculture and the inherent tourism that goes along with the wine industry, the current administration has decided to keep mum as it does not want to be seen as elitist, or insensitive to the plight of the average American. Let's not forget that in 2011 grape sales alone in the Napa Valley amounted to some $412,000,000 - that's a huge injection of dead presidents into the economy. By pandering to the pressure of those who perceive a state dinner as a snobby, let them eat cake moment (paired with a bottle of Two Buck Chuck, perhaps? ), the White House has deprived individual US vintners of a valuable marketing opportunity to promote those wines chosen. Elitist? Well I know that I, for one, cannot afford to buy a $400 bottle of wine, but somebody can. And that somebody is instrumental in keeping thousands of Americans (and foreign nationals, e.g. me) employed in the Napa Valley's wine industry alone. Selective transparency at it's best. Clear as mud! My old brownie is 14 years old today. Isn't she gorgeous? V1 spends most of her time snoozing these days; of late she can only really hear me when I whistle to her, the clicking noise of the cookie jar being opened, and the whir of a neighbour's Volvo as it speeds past Vinoland (which still sends her tearing down the driveway in hot pursuit). But, she watches my every move and was my constant companion over the weekend as I pruned the vines. Whilst posing in her birthday finery, a turkey vulture flew overhead and distracted her, but it actually made for a cute photograph. She's a great dog. Wakey, wakey, rise and shine. Guess what's happening in Napa? A little more advanced than mere bud-swell, it is budbreak 2012. Vinoland's Orange muscat vines are up and running for the season, and will be closely followed, so far as I can tell, by the Pinot grigio vines. Now, I just have to worry about frosty mornings. I spent most of yesterday pruning Vinoland's Cabernet sauvignon vines. I will also spend most of today, tomorrow and Sunday pruning Vinoland's Cabernet sauvignon vines. Then, I'll move on to the Syrah. I'm not complaining, I love it. The weather is behaving, so it's really a joy to be outside in the springlike temps. The above photograph is from my most recent assignment for my photography class. The vineyard, in Oakville, has not yet been planted, but the trellising system has already been established. No vines, no pruning. Easy peasy! The Bradford Pear trees (Pyrus calleryiana) at TWWIAGE are in full bloom. Whilst eating my lunch yesterday, I was treated to a visit from a Mourning Cloak butterfly (Nymphalis antiopa). 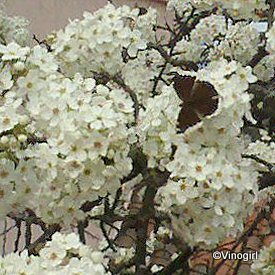 This rather large brush-footed butterfly, known as the 'Camberwell Beauty' in England, didn't seem to be in a hurry to go anywhere other than the safe haven of this blossoming tree. I watched as the friendly lepidoptera flitted from cluster to cluster, probably enjoying a lunch of nectar while I munched on an apple. Of course, it was extremely windy and he most likely just wanted to stay put and avoid having his wings blown off! The high winds of the past two days have now abated, and although I heard fans running in a neighbouring vineyard when I let the Vinodogs out this morning, the frost that had been forecast for this sunny, March morn did not materialise. Roll on budbreak...but not before I have finished pruning. Pruning in the Napa Valley is in full right swing now. I hope to begin pruning Vinoland's black grape varieties today or tomorrow. Vinoland is very fortunate not to have an issue with high vigour in the vineyard. The vines here are rather well balanced individuals, in part due to the fact that they are head trained and in some part due to the fact that our soil is lousy. Except for one small area that is. In that particular location the vines are planted a little closer together, one row is cordon trained and, seemingly, the vines have found something particularly appealing to them beneath their roots - so they misbehave. But, what if high vigour was an issue here, as it is on the highly fertile valley floor? What could be done to suppress the vigour in the vines at the onset of their annual growing cycle? Planting a cover crop could be one solution, but another approach would be to leave kicker canes on the vines. A kicker cane (aka a sacrificial cane or a vigour diversion cane) can be very helpful in controlling overly enthusiastic vines. This method involves retaining supplemental, disposable canes at pruning time - at the crown of a head trained vine, or at the apical end of a cordon trained vine. In the cordon trained vine, a kicker cane takes advantage of a grapevines natural disposition towards apical dominance and can also aid in delaying budbreak. Increasing the number of buds retained per vine has an overall vigour reduction effect as the kicker cane becomes a sink for new growth. Later, after budbreak, the entire cane will be removed to ensure it doesn't sap too much of the vine's vigour. 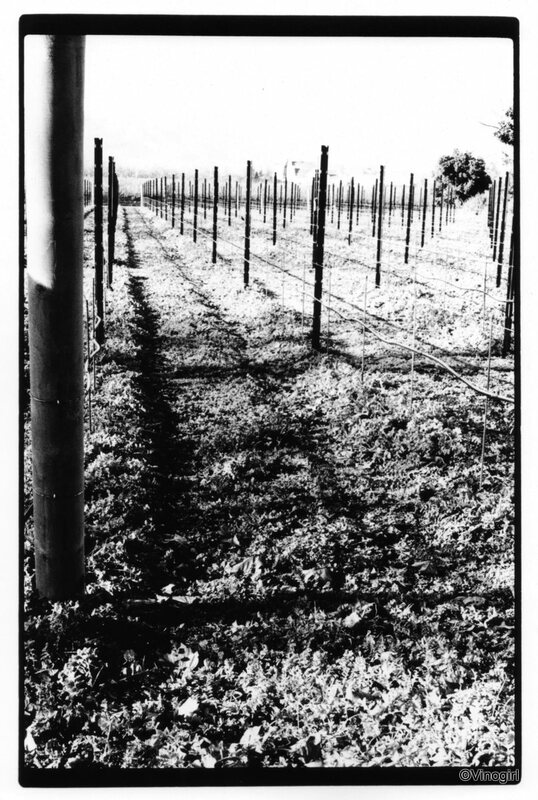 In the photograph above it is clear that when the kicker cane is removed only the desired 2 bud spur, on this old quadrilateral-cordon trained vine, will remain. Okay, that's enough of that, I'm off outside to prune! Daffodils are blooming all over Vinoland right now. They're so cheerful looking I can't help but smile upon seeing them.